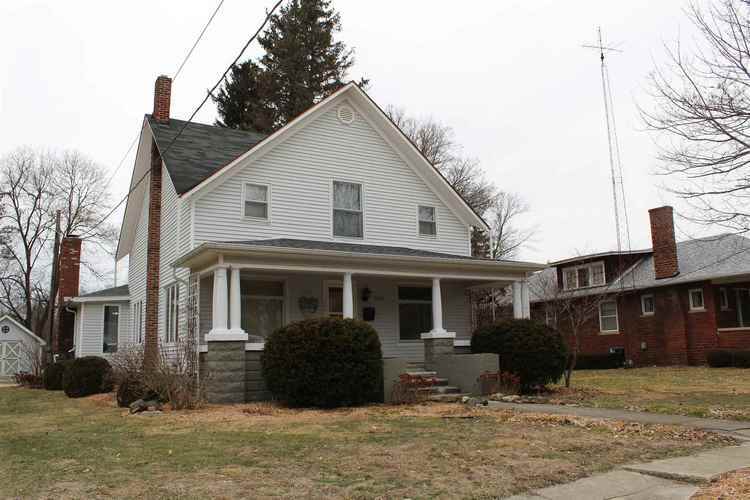 Welcome home in this cozy, 1910 bungalow styled home. With tall ceilings and beautiful built-ins, this house will not disappoint you. Fresh paint in several rooms. This 4 bedroom, 2 bath home features a main floor master suite, an eat-in kitchen with a fireplace, and lots of storage space. All three bedrooms on the second story have sizeable closets that are almost "mini" rooms. Main floor bathroom includes a jet tub. Attic space could also be completed for additional footage. Two car detached garage has plenty of space for a work bench, ample storage racks, and an attic for over flow. An entertainment deck is situated west of the garage. A separate shed is also included that could easily store more outside toys. Deep town lot. LOTS of beautiful landscaping. Schedule your tour today! Directions:US 30 to SR 331; South on SR 331 to property. House on west side of road.